People can summarize a complex scene in a few words without thinking twice. It’s much more difficult for computers. 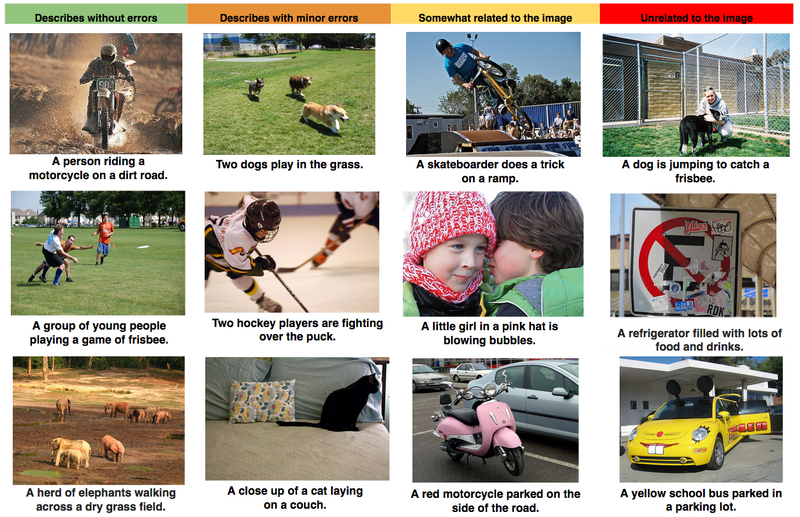 But we’ve just gotten a bit closer -- we’ve developed a machine-learning system that can automatically produce captions (like the three above) to accurately describe images the first time it sees them. This kind of system could eventually help visually impaired people understand pictures, provide alternate text for images in parts of the world where mobile connections are slow, and make it easier for everyone to search on Google for images. 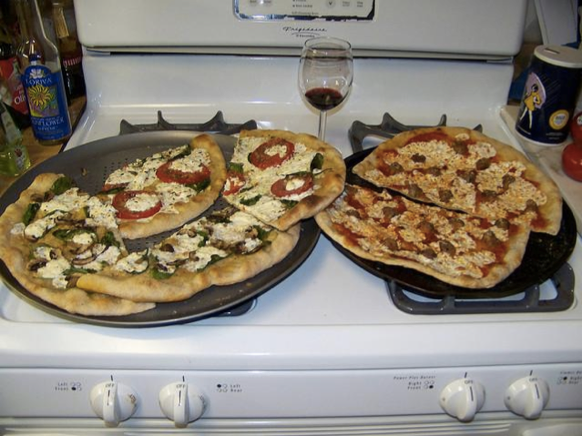 Recent research has greatly improved object detection, classification, and labeling. But accurately describing a complex scene requires a deeper representation of what’s going on in the scene, capturing how the various objects relate to one another and translating it all into natural-sounding language. Many efforts to construct computer-generated natural descriptions of images propose combining current state-of-the-art techniques in both computer vision and natural language processing to form a complete image description approach. But what if we instead merged recent computer vision and language models into a single jointly trained system, taking an image and directly producing a human readable sequence of words to describe it? This idea comes from recent advances in machine translation between languages, where a Recurrent Neural Network (RNN) transforms, say, a French sentence into a vector representation, and a second RNN uses that vector representation to generate a target sentence in German. Now, what if we replaced that first RNN and its input words with a deep Convolutional Neural Network (CNN) trained to classify objects in images? Normally, the CNN’s last layer is used in a final Softmax among known classes of objects, assigning a probability that each object might be in the image. But if we remove that final layer, we can instead feed the CNN’s rich encoding of the image into a RNN designed to produce phrases. We can then train the whole system directly on images and their captions, so it maximizes the likelihood that descriptions it produces best match the training descriptions for each image. The model combines a vision CNN with a language-generating RNN so it can take in an image and generate a fitting natural-language caption. Our experiments with this system on several openly published datasets, including Pascal, Flickr8k, Flickr30k and SBU, show how robust the qualitative results are -- the generated sentences are quite reasonable. It also performs well in quantitative evaluations with the Bilingual Evaluation Understudy (BLEU), a metric used in machine translation to evaluate the quality of generated sentences. A selection of evaluation results, grouped by human rating. A picture may be worth a thousand words, but sometimes it’s the words that are most useful -- so it’s important we figure out ways to translate from images to words automatically and accurately. As the datasets suited to learning image descriptions grow and mature, so will the performance of end-to-end approaches like this. We look forward to continuing developments in systems that can read images and generate good natural-language descriptions. To get more details about the framework used to generate descriptions from images, as well as the model evaluation, read the full paper here. This week, thousands of people from more than 160 countries will gather in Sydney for the once-in-a-decade IUCN World Parks Congress to discuss the governance and management of protected areas. The Google Earth Outreach and Google Earth Engine teams will be at the event to showcase exemplars of how technology can help protect our environment. Monday, November 10th - Tuesday, November 11th: Over the last couple of days, the Google Earth Outreach and Earth Engine teams delivered a 2-day hands-on workshop to develop the technical capacity of park managers, researchers, and communities. At this workshop, participants were introduced to Google mapping tools to help them with their conservation programs. November 13 - 19: Google will be at the Oceans Pavilion inside the World Parks Congress to demonstrate how Trekker, Street View and Open Data Kit on Android mobile devices can assist with parks monitoring and management. Friday, November 14, 9:30-10:30am: Join a Live Sydney Seahorse Hunt in Sydney Harbour, via Google Hangout, with Catlin Seaview Survey and Sydney Institute of Marine Science. Richard Vevers, Director of the Catlin Seaview Survey, will venture underwater to his favorite dive site and talk with experts about the unique marine life (including seahorses!) that explorers can expect to find around Sydney. Tune in here at 10:30am to catch all the action. Saturday, November 15th, 8:30am: Networking for nature: the future is cool. Hear about how technology-driven ocean initiatives can help us better understand and strengthen our connection with our natural environments. WPCA-Marine’s plenary session will includes presentations by Sylvia Earle and Mission Blue, Catlin Seaview Survey, Google, Oceana, and SkyTruth. The session will also feature leading young marine professionals Mariasole Bianco and Rebecca Koss. Saturday, November 15th, 12:15pm: We’ll be hosting a panel discussion on using Global Forest Watch to monitor protected areas in near-real-time. Global Forest Watch is a dynamic online alert system to help park rangers monitor and preserve vast stretches of parkland. Saturday, November 15th, 1:30 - 3:00pm: At the Biodiversity Pavilion join Walter Jetz from Yale and Dave Thau from Google for a presentation on Google Earth Engine and The Map of Life. The presentation will showcase how Google Earth Engine is being used in a variety of conservations efforts - including monitoring water resources, the health of the world's forests, and measuring the impact of protected areas on biodiversity preservation. We will also announce a new global resource from The Map of Life for mapping and monitoring biodiverse ecosystems. We believe that technology can help address some of our world’s most pressing environmental challenges and we look forward to working with Australian conservationists to integrate technology into their work. You can find us at the Oceans Pavilion inside the World Parks Congress, where we will be joined by our environmental partners including The Jane Goodall Institute, The World Resources Institute and The Map of Life. We hope to see you at one of our events this week! 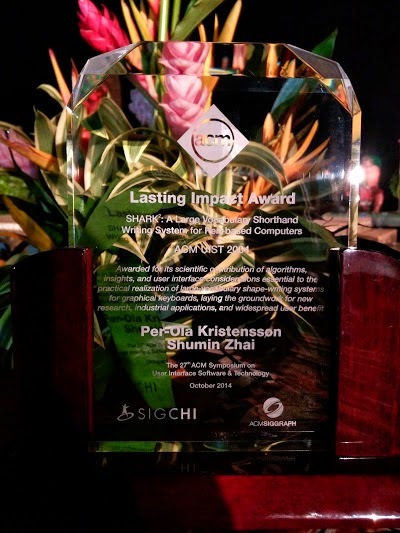 Recently, at the 27th ACM User Interface Software and Technology Symposium (UIST’14), Google Senior Research Scientist Shumin Zhai and University of Cambridge Lecturer Per Ola Kristensson received the 2014 Lasting Impact Award for their seminal paper SHARK2: a large vocabulary shorthand writing system for pen-based computers. Most simply put, this is one of those rare works that is responsible for fundamental and lasting advances in the industry, and is the basis for the rapidly growing number of keyboards that use gesture typing, including products such as ShapeWriter, Swype, SwiftKey, SlideIT, TouchPal, and Google Keyboard. First presented 10 years ago at UIST’04, Shumin and Per Ola’s paper is a pioneering work on word-gesture keyboard interaction that described the architecture, algorithms and interfaces of a high-capacity multi-channel gesture recognition system-SHARK2. SHARK2 increased recognition accuracy and relaxed precision requirements by using the shape and location of gestures in addition to context based language models. In doing so, Shumin and Per Ola delivered a paradigm of touch screen gesture typing as an efficient method for text entry that has continued to drive the development of mobile text entry across the industry. "Awarded for its scientific contribution of algorithms, insights, and user interface considerations essential to the practical realization of large-vocabulary shape-writing systems for graphical keyboards, laying the groundwork for new research, industrial applications, and widespread user benefit." Prior to joining Google in 2011, Shumin worked at the IBM Almaden Research Center for 15 years, where he originated and led the SHARK project, further developing and refining it to include a low latency recognition engine that introduced the ability to accurately recognize a large vocabulary of words based upon the patterns (sokgraphs) drawn on a touchscreen device. SHARK and SHARK2 subsequently continued further development as ShapeWriter. During his tenure at IBM, Shumin additionally pursued a wide variety of HCI research areas including, but not limited to, studying the ease and efficiency of HCI interfaces, camera phone based motion sensing, and cross-device user experience. At Google, Shumin has continued to inspire the Human-Computer Interaction research community, publishing prolifically and leading a group that incorporates HCI research, machine learning, statistical language modeling and mobile computing to advance the state of the art of text input for smart touchscreen keyboards. Building on his earlier work with SHARK/ShapeWriter, Gesture Typing is just one of the innovations that make things like typing messages on mobile device easier for hundreds of millions of people each day, and remains one of the most prominent features on Android keyboards. Shumin has been highly active in academia during his career, as both visiting professor and lecturer at world-class universities, and is currently the Editor-in-Chief of ACM Transactions on Computer- Interaction, a Fellow of the ACM and a Member of the CHI Academy. We’re proud to congratulate Shumin and Per Ola on receiving one of the most prestigious honors in the Human-Computer Interaction (HCI) research community, and look forward to their future contributions.